Outback Girl asked in the comments where the quilt in the photo came from; as she has her settings to hide her email I'm answering her here. 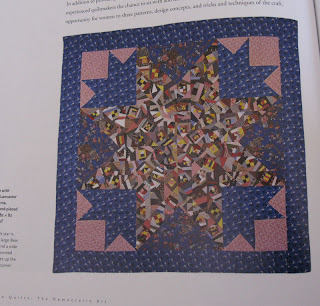 It's from The Quilter's Resource Book by Maggi McCormick Gorden. I don't know how available it is here in Australia, so here are the measurements we used to recreate the quilt. The ninepatches are made from 1.5" strips, each little square finishes at 1" and the finished size of each nine-patch is 3". 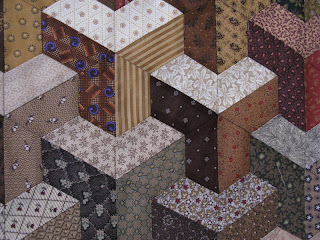 They are set together with 3.5" squares, to give a final block size of 9" (9.5" with seam allowances). I used 3.5" by 9.5" strips to make the sashes, and a 3.5" square in the corner posts of the sashes. 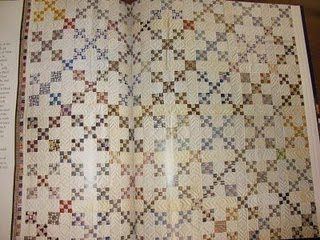 There will be a small cream border of 2.5" strips, then a pieced border of the 1.5" strips, then a 2.5" border of plaid. I'm almost finished the pieced borders, now if I can just keep sewing in between a visit to the vet, a 60th b'day afternoon tea for a friend and dinner with the DB and SIL, I just may see this finished in 2009. 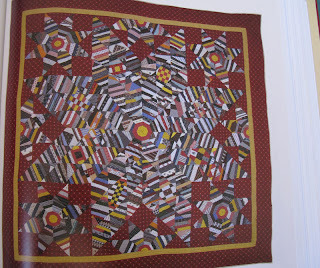 Pdudgeon asked in the comments if I could show another quilt from the Robert Shaw book, so here it is. It's called Carpenter's Square, and it's rather intriguing. I imagine you could make it look interwoven if you selected the colours carefully. And another blue and white quilt caught my eye; love this Burgoyne Surrounded with the eagle border. That's on my list of things to do, but I may have pacing horses instead of eagles. This book is giving me hours of entertainment, it's worth every penny, and I haven't even looked all the way through it yet. There are lots more pages to go. My goal of quilting one quilt a day was totally unrealistic, but you have to aim high, even if you know you'll fall short. So far I've done 5 quilts, but the grey Starstuck was given away without a photo. It turned out very nicely, and next time I visit my nephew I'll take a photo for the records. 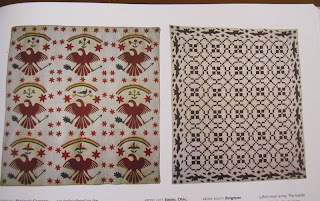 The Quidditch quilt has a simple allover cross-hatch, and the others have pantos. I'm thinking that I need to do one of my 'good' tops next, something thing that requires custom work. But which one? I have so many to choose from, I will just have to shut my eyes and point. Our Dear Brother and Sis-in-law are staying for two weeks, so there has been socialising, and not much quilting or piecing. Out to dinner at the pub last night, and then four episodes of Prime Suspect; it was a big night, and no sewing was attempted. I have another goal of finishing a UFO before 2010 arrives, which means I'd better get busy. I have to go find something that just need borders, or can be repurposed into a smaller finished object. And that is NOT cheating, you can look it up in the Rule Book. Heck, throwing things away is allowable, so making potholders instead of a QS quilt is definitely legitimate. I do need potholders, come to think of it. 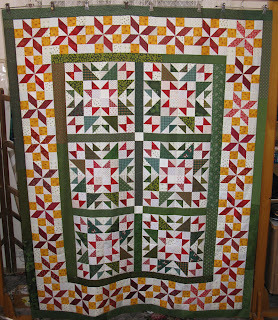 The mystery quilt top is finished, and I am very pleased with it, I love that border of star blocks, it's so cheerful. To make the blocks fit exactly I made the side sashes 3" (3.5" cut) and all the others 2" (2.5" cut). That made all the measurements of the pieced centre a multiple of 8, and the star blocks fit perfectly. The little green border around the outside is 2.5". I should be good and quilt this so that it's ready for next Christmas, but I won't commit myself to that; there are a mighty lot of quilts in the queue already. There are a lot of spare parts leftover, but they will find homes in other projects. I used up so much material, it was a great way to clean out the scrap drawers. Bonnie's mysteries are always fun. My Christmas present to myself was this enormous book, which I have only skimmed through so far. It's a beautiful book, very good quality, and well worth adding to the collection. If you live outside the USA I can recommend the Book Depository in the UK; they have free shipping, and I've never waited more than 8 days for a book to arrive, which is pretty amazing. Several of the quilts caught my eye straight away. There's definitely a theme happening here. This is the layout for my Mystery blocks, it will make a large wallhanging or a single bed quilt. There will be a row of the Poinsettia Stars all around as a border, I'm hoping to get it all in one piece today. I love those Christmas Stars, they're so graphic. 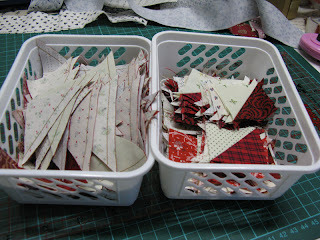 I'm going to have heaps of leftovers, but they will be pieced into table runners and banners, or maybe a tree skirt. I'm just concentrating on finishing the quilt first. 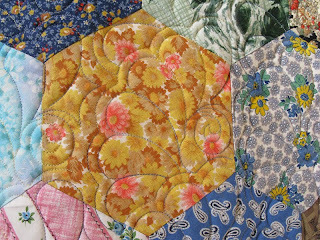 I quilted my Vintage Hexagons, and I love how it turned out. I used a new panto, Feather Fan, and I'm in the process of getting it up on the website now. 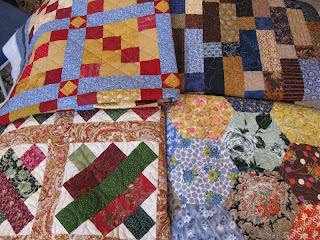 I have dozens of new patterns to upload, things that I designed for customer quilts throughout the year. I know I'm on holiday, but I'm really enjoying being able to work uninterrupted, so I'll keep on with it. Some of these old fabrics are truly horrible, but I love them anyway. And some are so gorgeous that I would love to have metres of them. As of today I'm on holiday, and I intend to get a lot achieved in the next two weeks. Mereth and I want to keep Millhouse quilting a top of ours every day, and we managed to do that over the weekend. Two down, and many more to go. 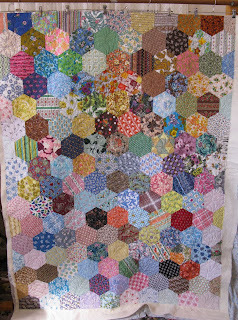 Now I'm halfway through my Vintage Hexagon quilt, hopefully it will be finished this afternoon, and then Mereth will load whatever project she has planned. The workroom is going to be a hive of activity for the next fortnight. 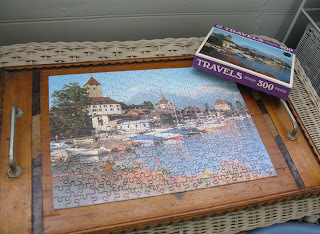 I've already finished one jigsaw, and have the next one ready to go. That spells Christmas and relaxation for me, it's the only time of the year I let myself do puzzles. 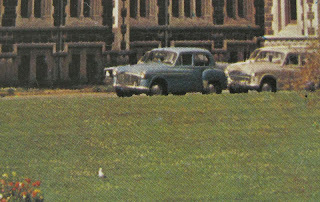 I love vintage ones, epecially when you can see elderly cars like this one, or people wearing strange fashions. Modern jigsaws are often pixelated from the digital images used, so I'll keep collecting vintage ones whenever I come across them. 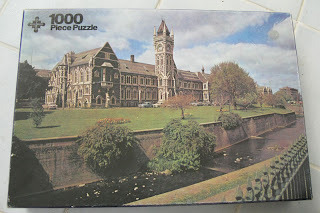 And I discovered another advantage of vintage jigsaws when I opened the box; the last maker has packed it away in three sections, which will make it much easier for me to get this 1000 piece puzzle finished. My main aim before the end of the year is to finish a few more UFOs, and I chalked up number one yesterday. This Inner City is from around 1999, and I just couldn't seem to finish it; I always needed one or two more units to make the edges straight, and then I wanted it bigger, and then I couldn't find the right border stripe... and so on. But it's done now, and I'll hand quilt this one for a wallhanging; I love the optical illusion, and if it's hanging on a wall I'll enjoy it so much more. The colours are quite drab, I can see that I may make this again in brighter colours. It was easy to piece, just half hexagons arranged in light, medium and dark. My stash these days is so much better than when I started this, I would be choosing from fantastic reproductions now; wouldn't it be silly to start another striaght away, when I haven't even enjoyed the satisfaction of finishing this one. This afternoon I will get Bonnie's mystery blocks set together I hope, and I'll post the layout I've chosen. I just can't use another huge bed quilt, but I do need Christmas wallhangings and table runners, so that's what my blocks will become. I'll be all set to decorate next Christmas, thanks to Bonnie. 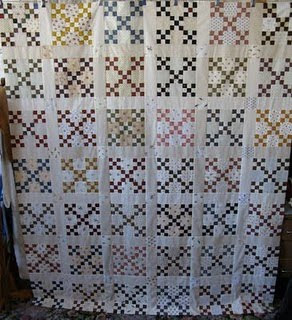 The Chain of Arrows quilt is finished at long last, it sat waiting for it's binding for at least two months. I just couldn't get motivated to start it, but when I did sit down and do it I was finished in an hour and a half. I can't believe I put it off for so long. I love the finished quilt; I used a bamboo/cotton batting and it feels lovely and soft. Once it's washed I will decide if I like it enough to use it again. Apart from that, the only sewing I've done is those mystery blocks, but that's enough. 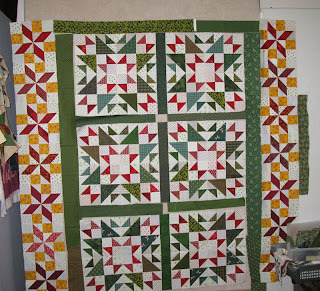 I can't believe that I would willingly sign up for this much piecing; 100 8"blocks, just before Christmas. Madness, but still a lot of fun. Sewing the little leftover triangles seriously added to the amount of time the Step 3 units took, but it was well worth it. 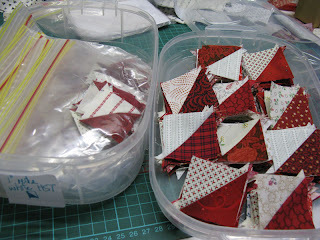 I have nearly 400 of these to add to my stash, and by a happy co-incidence I was already making 1.5" red and white HST. I have a container half full of them already, earmarked for a Pine Tree quilt, so I'm well on the way with these latest additions. I'm so glad that the colours Bonnie chose worked in so well with my own private plans, or I'd have 400 HSTs to use up in some other way. And speaking of waste triangles, when I made my black and grey Starstruck quilt, I firmly put all the trimmed off triangles in the bin. I had a few doubts when the bin rapidly filled up, and I realised just how much fabric I was throwing away. But I was strong. Until Mereth saw what I was doing, and was horrified. She 'rescued' it all, took it back to her sewing room and produced this little block. Too cute. On several visits to her place I needed something to do, so I sewed and pressed and trimmed the other triangles for her; and then seeing as I'd done all the work anyway I took it all back and I'm currently making a small quilt out of the pieces. So much for putting it all in the bin; I tried, I really did! A friend was married last weekend, and it was a beautiful wedding. The flowers were stunning, and the bride left instructions that they were to be given to anybody who wanted them, and the excess sent to the hospital. We brought home a bucket of them, three shades of pink and an amazing green rose; there is something magical about masses of roses, they are just glorious. I hope the people at the hospital enjoyed them too. I spent the whole weekend working on the units for Bonnie's latest mystery, and I'm still not caught up. Mereth sewed some of the step 2 units for me, and cut strips for other steps, so I haven't done all the work myself and I can't really complain. I don't have to keep up with everyone else, I could just sew at my own pace, but somehow it doesn't work that way. 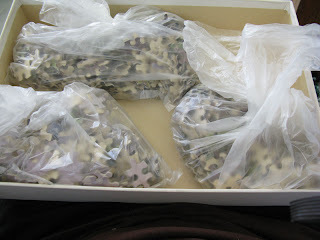 I couldn't settle to anything else while I knew that huge pile of pieces was waiting for me. I'm glad I was dedicated enough to keep at it, and now that Bonnie has started putting the blocks together I'm not so anxious; I love the look of the blocks, and I'm sure I'll finish this according to plan. But how does Bonnie do all this work, in so little time? She amazes me. I think this will be a lovely Christmas quilt, and I've enjoyed making it so far, even though it's been a marathon effort to keep up. I must be slowing down in my old age. Lookit all these dog-ears trimmed from the triangles. I keep these and give them to Mereth; it stops my sewing room getting messy from all these tiny scraps, and she has a place for them and welcomes every little snippet. She'll have to show you a picture of what she does with them. It's been nothing but socialising these last two days, and trying to get some work done in between. We've quilted a lot of Christmas runners and banners lately, and they're all ready to be sent home to their owners. I've managed to put up one tree in the workroom and decorate it with little household items that we find cute. Both of us have a collection of cookie cutters and metal kitchen gadgets, and some are really decorative, so they have made their way on to the tree this year. The yo-yo garland is an on-going project; I save a square of the backing fabric from every quilt we quilt on Millhouse, and make it into a yo-yo. We have added more than 80 this year, and the length is quite impressive. It's all colours and we can't plan it, but I love the variety of fabrics and patterns, and it's interesting to remember the quilts they came from. On our way out to visit Matt we drive past a field of cows and calves, with the odd bull thrown into the mix. They are all the most gorgeous mix of cream, mocha and chocolate colours, but I think this girl is the prettiest. That spot on her forehead really sets off her dark eyes and dished face. What a darling. 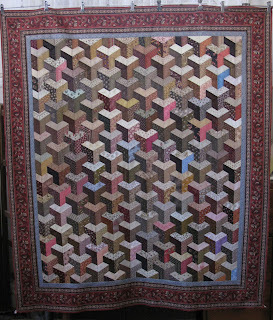 I mentioned my Grey Havens quilt, and then realised that I had never posted a picture of it. It's a quilt I made after my Mum died in 2006; I just began making the blocks, and realised afterwards that it was my 'mourning' quilt, lots of blacks and greys. It's a block that is sometimes called Lost Ships, and that reminded me of the Elves in Lord Of The Rings, taking their ships to the Grey Havens, which is how they depart Middle Earth. So I called my quilt Grey Havens. Once I knew it was a mourning quilt, I wanted to make it even more significant, so I used fabrics that had a lot of meaning and memories invested in them. (More of that here.) And I even extended that to the backing. 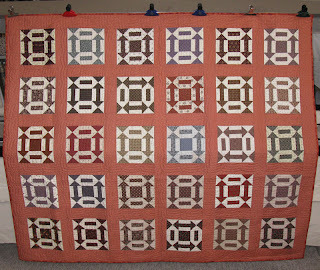 Here is the pieced backing, of 10"squares. 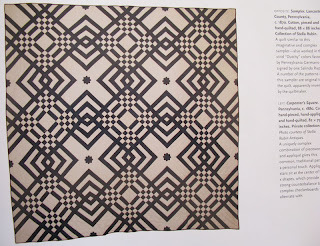 There is a cross of light fabric on the left, with a darker square in the middle. Those two fabrics are pieces of a dress of Mum's, and a pyjama set of Dad's. The dress was a purchased cotton sundress that I remember Mum wearing when we were very small. I recall watching her iron it, in the days when laundry had to be sprinkled with water from a sprinkler bottle, which was a plastic bottle that had a wide perforated top. All the ironing was damped down, rolled up tight and stacked in the laundry basket, covered with a towel. Then Mum worked her way through it all, piece by piece, and the iron made a satisfying sizzle as it hit the damp cloth. No steam irons in those days. Around about 1965 Mum made Dad a set of pyjamas and a shave coat from this fabric, cut out on the kitchen table while we watched, fascinated; then sewn together on the machine I still use for a lot of my piecing. The actual pyjamas were worn and discarded. I thought the material we had were the scraps from that, but when I cut this square out I realised that the pieces were a set of pyjamas for my elder brother that had never been made up. One of Mum's UFOs. Life got terribly busy for her once our Dad died, and many items of clothing that had been cut out had to be abandoned as she went out to work. And we grew too much to make finishing them worthwhile, so there they sat, and still sit, in some cases. When I saw the pieces for those little pajamas it made me remember when my brother was that small, and how much Mum loved to sew, and how much she loved to provide for us. I guess some of my UFOs will be around for my children and grandchildren to find, and I'm OK with that. 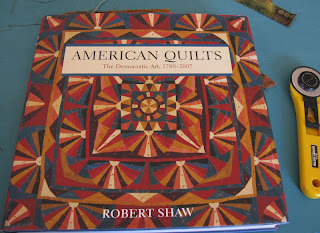 I hope they'll remember me and my quilts for a long time. Just because I haven't been posting, doesn't mean I haven't been doing things. I've been obsessed with the Dear Janes for two weeks, and completed another 30 blocks. I think I'm over the hundred mark now, I will have to count them all up. It's been fun, and frustrating, and interesting, and satisfying, but I'm about ready to pack them all away and get back to normal sewing. I just can't see that sewing 1/2"squares and 7/8"triangles is normal; it's bizarre, and I wouldn't contemplate it for any other project. But if Jane did it, then so must I. The first day of the cool weather we went out for a walk at Bowmans Park with the dogs, who had been cooped up inside for days. They had a ball, racing through the bush and revelling in the light rain. I took a whole series of photos of Dolly, and not one of them turned out; she is always moving, and all I capture of her is a blur. Finally Matt held her still, so I could get a protrait of her and her dad; they are the best of friends, I love watching them play together. She's not that much smaller than him now, and she can outrun him too. She's lightning quick. These dreary blocks are more Broken Dishes, made with the cast-off triangles from the bindings that I make. I have no idea why I started doing this, probably from a misguided sense of economy, and I have no idea why I keep doing it. Most binding fabrics aren't particularly wonderful, so the combinations in the blocks are not anything I would normally choose. I guess I'm making it so that one day, when it's a quilt, I can show it to people and say 'Each block is the leftovers of bindings from two quilts, so there's 60 (or 80 or whatever) quilts represented.' 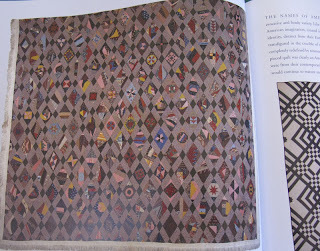 And people will stare sideways at it and say 'Oh how interesting' and leave me to enjoy my ugly quilt. But I won't stop making the blocks either; maybe I"ll just use nicer fabrics in my bindings. It's been one of those non-stop weeks, full of outside appointments that play havoc with blogging, but I think we're done with all that now, and it's going to be workroom time from now on. We have Christmas quilt deadlines to meet for customers, so there will be a few marathon sessions to get as much done as soon as possible. I'm looking forward to it, especially as the weather is being so beautifully cool; it makes you want to get busy working when the conditions are so pleasant. Last week I went through my grey fabric and culled 13.5 metres of stuff I didn't love. I have two grey quilts to make backings for, so I sliced up this pile, and another one the same size, into 10.5"squares for a Bonnie Backing. 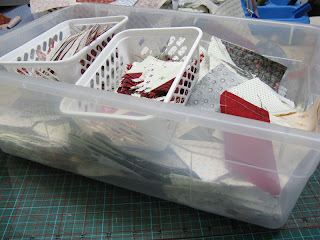 (See this page for Bonnie's Scrap User's System and her thoughts on backings, including a list of links to photos of pieced backs) Mereth and I have different attitudes to pieced backs. She doesn't see the sense in cutting lengths into smaller pieces, whereas I like the regularity of the squares. It's more piecing and more seams, but I love how it looks. So we agree to differ. Now I just need a few spare moments to sew these together, and I will have an interesting back for my Grey Havens quilt. I needed more than 90 squares, so it certainly used a lot of fabric; I'm down to one drawer of greys and blacks, and I'm very happy about that. And I won't be buying more to replace them. The Colonial Squares is just about the easiest patchwork to make, one simple square repeated, but I followed a few simple rules to make sure it went together easily and with no fuss. I decided to make four patches from my squares, and sew them together later. They made the perfect leader-ender project; I just picked up a light and a dark square and fed them through. The seams were pressed to the dark side. When I sewed the four patches I made sure that the darks and lights were aligned the same in every single one; the dark patch underneath on the right, dark patch on the top to the left. The seams were fanned, by unpicking the few stitches in the seam allowances on each side, and then pressed open. By doing that all the seams of the fourpatches nest, no matter how you rotate them, which allowed me to twist and turn them when laying the whole thing out and I never had to worry about seam allowances. When I joined the four patch blocks I fanned those seams too. I didn't worry about colour or balance or anything until I had amassed a large pile of four patches; then I laid out what I had and decided if I needed more black, or red, or tan and made more blocks accordingly. I made the centre square first, then made corners to turn it on point. To make the edge pieces I cut triangles using the Olfa triangle ruler; I used a 2.75" strip and put the 4 1/2" line on the edge of the strip. (If I wanted to cut them as quarter square units I'd start with a 5.5" square and crosscut diagonally into 4 triangles.) 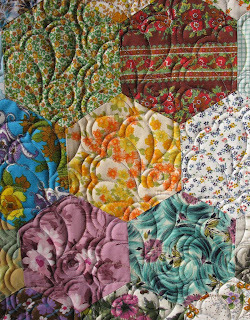 These might be a smidgeon too big, but that's a good thing, it will allow a bit of leeway when it's time to trim the quilt edges. Two sides of the quilt needed light triangles, and two needed dark. I could have had it dark all round the edge by adding a single row of squares on two sides of the central four patches, but I didn't care enough. I quite like the light and dark edges. I checked which way the seams wanted to go in the triangle unit, and then pressed them all alike. Then it was just a matter of piecing each corner, and adding it to the central part. And adding two triangles to complete the corner of the corner. My quilt measures 78"square; the central piece had 81 four patches. Each corner took 19 four patches and 8 triangle units, four dark and four light. Hmm, 157 four patches, plus the edges; that's more than 628 individual squares, what a lot of fabric. More than 5 metres in fact. I'm thrilled to have busted all that stash, and so painlessly. I'd definitely make one again. I have enough squares left over to make a good start.